Recombinant fragment, corresponding to a region within amino acids 1-290 of Human WBP11 (Uniprot ID: Q9Y2W2). Jurkat, Raji, K562, THP1 and HL60 whole cell lyastes; Human SkHep1 and Mouse C2C12 xenograft tissues. Our Abpromise guarantee covers the use of ab154590 in the following tested applications. Activates pre-mRNA splicing. May inhibit PP1 phosphatase activity. Ubiquitous. Highly expressed in the heart, pancreas, kidney skeletal muscle, placenta and brain (at protein level). Weakly expressed in liver and lung. Nucleus. Cytoplasm. Predominantly located in the nucleus with granular heterogeneous distribution. Excluded from nucleoli in interphase cells, distributed throughout cytoplasm in dividing cells. Colocalized with SC35 and U2B in the nucleus. In the cytoplasm, associates with the intermediate filament protein vimentin. 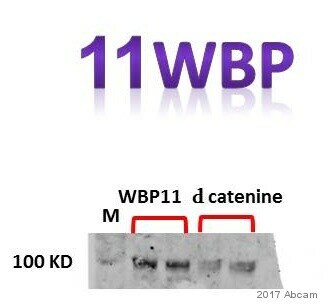 Immunohistochemical analysis of paraffin-embedded Human SkHep1 xenograft tissue, labeling WBP11 with ab154590 at 1/500 dilution. 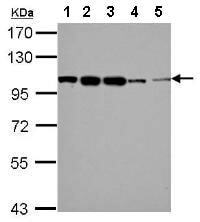 Immunohistochemical analysis of paraffin-embedded Mouse C2C12 xenograft tissue, labeling WBP11 with ab154590 at 1/500 dilution. ab154590 has not yet been referenced specifically in any publications. Publishing research using ab154590? Please let us know so that we can cite the reference in this datasheet.